Every Trakdesk account automatically comes with a wildcard SSL certificate for your default Trakdesk support portal URL. However, if you prefer to setup your own custom domain for your support URL and would like to use https protocol, you can upload your SSL Certificate to us and we will install it for you within 2 business days. Once the installation process has completed, we will notify you so that you can enable the Force SSL option to force your helpdesk to use https protocol. Login to your helpdesk as an administrator. Select the Security Settings option. Click on the Upload SSL button. Note: The Upload SSL button will only be visible if you have already setup your helpdesk to use your own custom domain. Select your .pem and .key files. 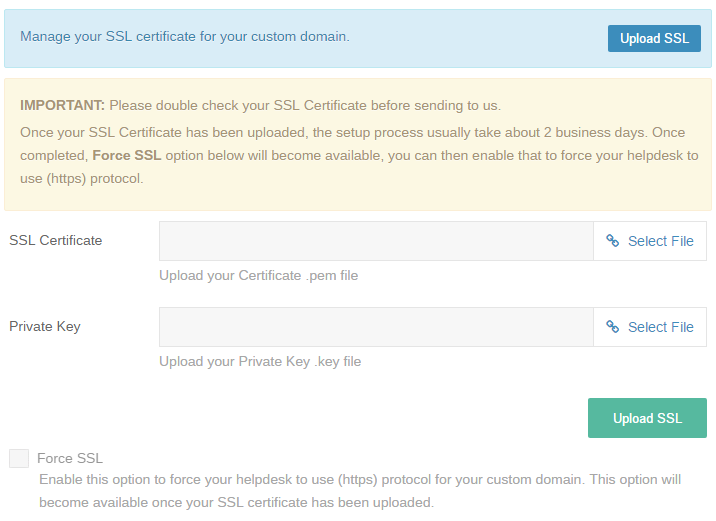 Finally, click on the Upload SSL button to upload your SSL certificate. Can you give us your feedback so we can improve this article? Why you did not find this article helpful?